from 26 October to 22 November 2018. Nestled in the beautiful Jezzine Art Gallery is the Nth Queensland Pastel Exhibition Bits and Bobs. Runs until 26th October. A unique collection of talented artists works all for sale at very reasonable prices. This Exhibition showcases the talents of a social group of artists who simply enjoy knife painting together. It shows an inspiring combination of styles and enthusiasm. All works are painted in oils and acrylics. The Townsville Watercolour Group has a long tradition of producing vibrant images of Townsville, its vegetation and animal life, mastering watercolour techniques to manage detail as well as enjoying a more abstract and contemporary delivery.. This exhibition by The Townsville Watercolour Group widens the group’s focus to include iconic images of the surrounding region; from the wet tropical areas to the north around Hinchinbrook, Magnetic Island to the east, Charters Towers and Ravenswood to the west and the wetlands and cane growing areas to the south. This year the group also embraces other media than their traditional watercolour. A variety of media is employed from oils, Inks, pen, acrylic… either alone or with watercolour. The vibrant works will take visitors on a tour of Townsville and its regions. Opening 11.00am Saturday, 28 October 2017. All welcome. TAS displayed works created out of the fabulous Freya Jobbins Workshop held at the Townsville Art Society Classroom in June 2017. "Watercolour Magic" showed until 3 August 2017. The Townsville Art Society showed an exhibition of works by members comemmorating the ANZACs coinciding with ANZAC day on the 25th April. Artists include: Danielle Woods, Janelle Bennett, Jennifer McAllister, Simmone Rayner, and Wendy Hocking. Exhibition comes down on Friday morning, 2 September 2016. This exhibition demonstrated each artists unique style and interpretation of the world around them. Artists were: Jenny Finn, Linda Huff, Dal Monaghan, Heidi Scharf, Marty Ironside and Robynn Munro. This exhibition showcased members' works relating to the Anzac theme. Here is a snapshot of works displayed. We also had a small display reflecting the T150 celebrations theme (see size restrictions below). All miniatures exhibited for these T150 celebrations are displayed in our Stockland Pop Up Shop. Here is a snapshot of a few of the wonderful artworks displayed. An exhibition by Pat Lowth runs from 23 January to 19 February at 'Art at Jezzine' Gallery. Pat is showing a group of acrylic paintings showing his skills, inspiration and a lot of colour. Imogen Rogers is an Edinburgh born Kiwi/Australian artist who calls Townsville home. She began studying at The Great Barrier TAFE in 1995. Since then painting has remained a constant outlet for expression. She has had a prolific impact on the NQ Art scene for the past ten years. Imogen's work can be found in collections throughout Australia and overseas. Please join with her in celebrating the opening of her up coming show 'COLOUR MAGIC' with Art at Jezzine. Exhibition queries: Contact Linda Huff on 47234469 for further information. Gallery hours 10.00am to 4pm daily. Linda Huff, Jenny Finn, Dal Monaghan, Heidi Scharf, Robynn Morro and Kieran Sturgeon. “All Sorts” -- An eclectic mix of subjects and mediums by the Tuesday night social group Rendle Street Rats. Artwork by Gillian Barrett, Jenni Beri, Heather Byrne, Elise Edler, Tony Fitzsimmons, Richard Free, Sylvia Hewitt, Ed Kulpa, Emmanuel McCarthy. The birds we love to hate. Janet Ypinazar, Elvena Bycroft and June Pola. Appreciating the simple beauty within everyday objects and places. A dual photographic & mixed media exhibition from our beautiful Nth Qld reef, rainforest & remote panoramas. Each photographic scene is transformed into a trendy recycled or mixed media artwork underpinned by one word summations of the life lesson I see. "Do you see what I see....When I look at the world?" Transforming blank paper into scenes of island travels, in sound bites of time during busy weeks & months. Reflections, feeling supported by the ocean, one with nature, beauty, timeless moments of WOW. Hands-on using pastels, adaptable, messy, multilayered & fragile, reflecting the beauty & fragility of our environment. Ken Easton, Patricia Willis and Margie Roorda. On show September 9th - 5th October 2012. 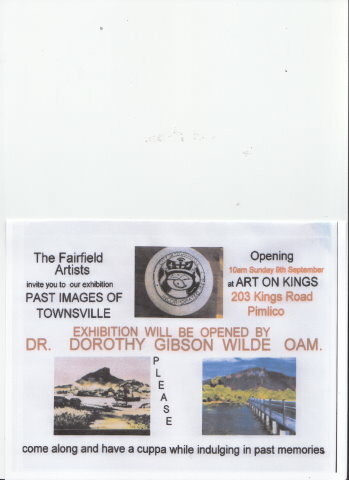 To be opened Sunday 9th September 10am by Dr Dorothy Gibson Wilde OAM. To view opening invite click here. On show August 12th to September 7th 2012. "My exhibition is influenced by a trip I took to Longreach as well as the beautiful electric blue Ulysses and green Birdwing butterflies that breed in my garden. After a visit to the outback whether it be flourishing with native flowers, in drought, fire or flood, I always come back to 'civilization' with a renewed spirit. My garden is also a relaxing bountiful source of inspiration as it gives me vegies, passionfruit and juicy citrus." A combined exhibition that explores all things Australian, animals, landscapes to bushfires. Artists are Jenny Finn, Heidi Scharf, Linda Huff, Dal Monoghan, Kieran Sturgeon, Sharon Jewell and Liz Barber. Sunday 15th July - Friday 13th August. WHAT... THE OPENING OF OUR EXHIBITION SHOWCASING THE TALENT OF STUDENTS WHO ATTEND BEGINNER CLASSES AND OPEN WORKSHOPS WITH JENNY FINN. An exhibition of still life images in watercolour. An exhibition of figurative and illustrative works expressing each artist's recollections and contemplations of previous journeys travelled. Lions and Tigers …. Many emotions conjured by a mere stare from these elite creatures. An exhibition using paint, pastel and pencil in an attempt to capture some of the mesmerizing qualities of these awesome giants of the Cat Kingdom. An exhibition of works, developed in the varying techniques of printmaking. A visual journey of the past two years of knowledge gained through the tuition from a number of workshops, Tafe and Studio practice. A blend of fine art and sculpture comes together in this exhibition called "The Spirit of Africa". Sculpture by Sharon Minon with art by Jenny Finn, both award winning artists in their chosen fields, working together to create a vivid and exciting display. Come on safari with us from January 29th at "Art on Kings”. A collection of watercolours depicting a variety of subjects from landscapes, seascapes, fauna etc. 'All Together Now Group Mural'. This was the main work featured in the art exhibition currently on display in the TAS Gallery insert in November. The work was done by 33 students across three classes and required a great amount of team effort and co-operation. This work has been donated to the Children’s & Womens’ Clinic at the Townsville General Hospital. emotion through colour, shape and texture. The Townsville Art Society is most grateful for the support offered by the following Sponsors of the Townsville Art Society's Annual Art Awards. "Copyright © 2011, Townsville Art Society Inc. All rights reserved.